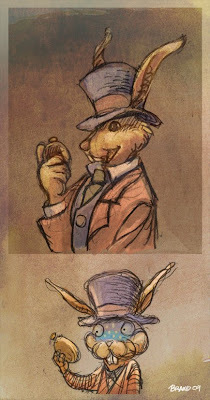 Great drawing, I illustrated the white rabbit from Alice in Wonderland too. dimanche, février 08, 2009 3:04:00 p.m.
Nice contrast of the two approaches. I think I like the goofier one. dimanche, février 08, 2009 3:22:00 p.m.
dimanche, février 08, 2009 3:39:00 p.m. Wonderful line work and color. dimanche, février 08, 2009 7:47:00 p.m. I did A in W too... and I agree. The goofy one is more interesting. The top one looks a lot like the classic white rabbit representation, but the bottom one seems to speak more to modern tastes. Humor rules! dimanche, février 08, 2009 8:31:00 p.m.
Lovely illustration! Looks like a vintage piece! lundi, février 09, 2009 7:50:00 a.m.
lundi, février 09, 2009 6:59:00 p.m.